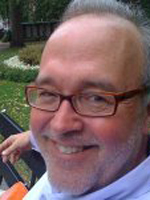 Timothy Lloyd has served as the executive director of the American Folklore Society since 2001. His office is located at The Ohio State University in Columbus, where he also serves as Adjunct Associate Professor of English. Before coming to the Society, Lloyd served as executive director of Cityfolk, a nationally recognized folk arts organization in Dayton, Ohio. Earlier still, he was assistant director of the American Folklife Center at the Library of Congress, before which he served for 14 years as director of folk arts programs for the Ohio Arts Council. He began his career as a staff folklorist for the Smithsonian Institution’s Center for Folklife and Cultural Heritage. Lloyd received his PhD in American studies from The George Washington University, with specialties in American folklore and cultural history, 19th-century American literature, and African art and culture. He has taught folklore at Colorado College, The George Washington University, The Ohio State University, and Utah State University. His research interests include American foodways, occupational culture, and the history of public practice in the field of folklore. He has published articles and reviews in the major American folklore journals, and co-authored Lake Erie Fishermen: Work, Identity and Tradition (University of Illinois Press), named the best maritime history book of 1990 by the North American Society for Oceanic History. Lloyd has served as a board and committee member or consultant for many organizations, including the French-American Foundation, the Fund for Folk Culture, the Michigan Council on the Arts and Cultural Affairs, the Michigan State University Museum, the Ministry of Culture and Communication of the Republic of France, the National Council for the Traditional Arts, the National Endowment for the Arts and the National Endowment for the Humanities, the National Recordings Preservation Board, the Ohio Arts Council, the Ohio Humanities Council, the Rare Books and Manuscripts Division of The Ohio State University Libraries, and the Smithsonian Institution. He represents the AFS within the American Council of Learned Societies, the National Humanities Alliance, UNESCO, and the World Intellectual Property Organization. In 2012 he is serving a residency for the Fulbright Specialist Program at the University of Jyväskylä in Finland.